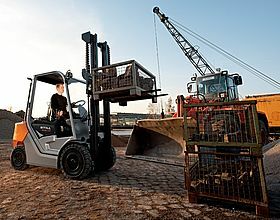 All types of lift trucks are suitable for stacking. Depending on the actual task, either counter balanced trucks or warehouse equipment may be preferable. Materials can be moved on a companies site by different types of lift trucks, platform trucks or tractors, or on tugger trains. 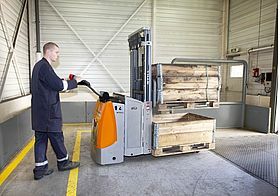 Usually goods will be carried on pallets if handled with counterbalanced lift trucks. 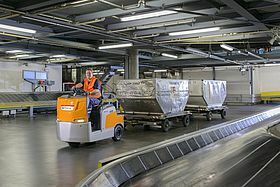 Platform trucks, tractors and tugger trains allow moving the goods on the load platform or in special trailers (trolleys). Depending on the type, tugger trains can move up to 5 trailers with a maximum load of 4t. Lorries parked at a docking position are usually loaded or unloaded with small counter balanced trucks or warehouse equipment. 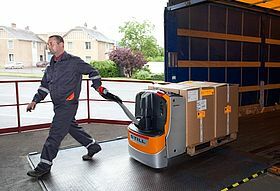 As the dock is directly accessed from the warehouse, electric trucks are normally used for this application. 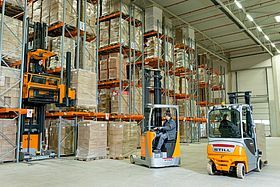 Depending on the type of goods handled, double decker trucks can be deployed in order to increase turnover performance. Lorries can be loaded or unloaded over the side by any type of counter balanced truck (electric, diesel, natural gas or hybrid) or by some warehouse equipment, for example reach trucks or certain types of high lift trucks. Depending on the quality of the floor surface or the weight of the goods to be handled counter balanced trucks are most suitable. Order picking means selecting defined quantities of materials from a larger range of articles. 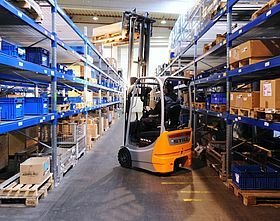 In general, the goods are picked from a warehouse or directly from production or other locations. Double deck trucks allow moving 2 pallets horizontally at the same time. 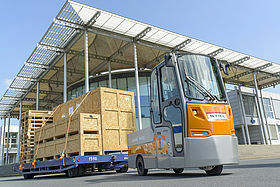 These trucks are the ideal helpers to efficiently load and unload lorries. Some truck versions are available with a stand-on platform for the driver. 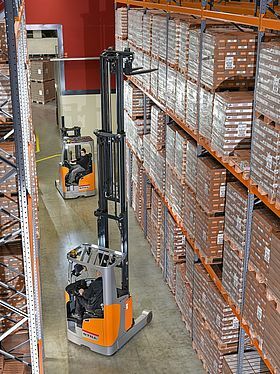 Narrow aisle trucks, also referred to as VNA, are ideal for work in narrow aisles where goods are stored at large heights. Tractors are electrically powered vehicles that are ideal for internal transport of goods over medium and long distances with or without trailers. Some truck versions are fitted with driver cabs or dedicated loading platforms and may tow a maximum load of 25 tons. Beyond this, the STILL Kanvan allows dual use as tractor and stacker. Tractors can be deployed as towing vehicles for tugger trains. Depending on the type, up to 5 trailers with a maximum load of 4 t can be attached to the tractor. 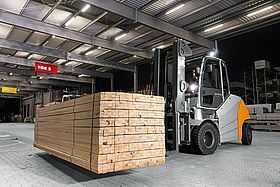 Typical areas of application are material transports between warehouse and production facilities (e.g. 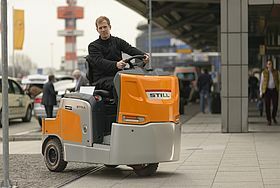 in the automotive industry, at air ports, railways or post). Typical for rider seated trucks are counter balanced trucks and tractos. 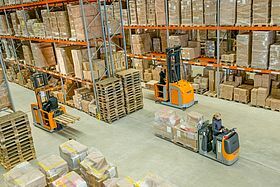 Besides this, some warehouse equipment is also operated by seated drivers. This type of operation is especially recommendable for long service times and long distances horizontally as well as vertically. Operation where the operator walks along the truck is referred to as 'pedestrian operation'. 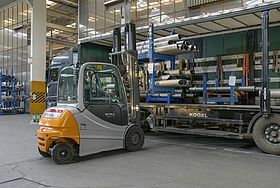 Typical truck categories here are low lift and high lift trucks. These trucks are fitted with a tiller that provides access to all relevant truck functions either electrically or mechanically. Operation where the operator stands on the truck is referred to as 'stand-on operation'. 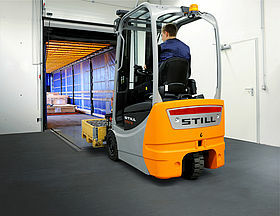 This type of operation is available for low lift and high lift trucks. Stand-on operation allows easy access to the truck and comfortable manoeuvring in tight spaces. 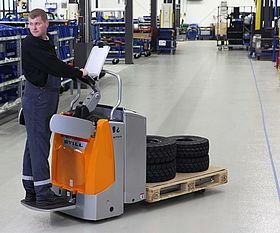 This category covers trucks that are only operated with the driver standing on a platform and trucks with a hinged platform which can be folded away if neccessary. Most hinged platforms are fitted with an adjustable air suspension and sides arms to protect the driver and to optimise comfort. 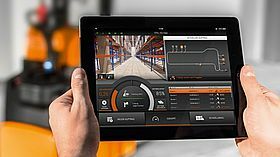 Certain types of warehouse equipment and tractors can be operated automatically to move goods horizontally or vertically. Automating vehicles is recommendable if defined tasks are repetitive. The load carrying capacity of a lift truck is a defined value and refers to the maximum permitted load weight (rated load capacity). 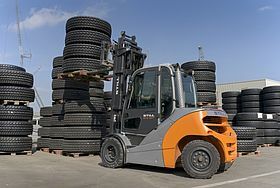 The actual load carrying capacity may deviate from this, depending on the centre of gravity of the load, for example, or the mast or any attachments mounted on the truck. The load carrying capacity is calculated based on the rated load carrying capacity of the truck. Measured from the top of the fork, the lift height refers to the maximum distance between the lowest and the highest position of the load (rated lift). The lift height is calculated on the maxium rated lift of the truck, depending on the mast mounted on the truck. The lift height actually available in practial work may also be determined by the weight of the load. The aisle width describes the space a truck with a load needs to turn and store a load. 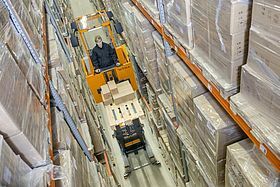 The maximum aisle width is calculated with a standard DIN Euro pallet (1 200 x 800 mm) with a safety distance of 100 mm on both sides. 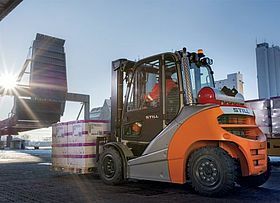 Manual operation means lift trucks that are moved by muscle power of the operator. 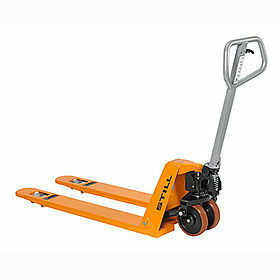 Typical vehicles of the category are the various types of hand pallet trucks. The vehicles are moved by muscle power. The goods are usually carried on pallets or boxes. The goods are lifted with a hydraulic pump operated by the tiller. These trucks achieve load capacities of up to 3 tons. With respect to the environment, energy saving and sustainability, electrically powered trucks are of growing significance. Today, electric trucks achieve similar performance values as diesel trucks do. Electric trucks are more expensive to purchase, but due to the energy savings they are more economic in the long run than the diesel versions with a lower purchase price. Due to the low noise and emission free operation, electric trucks are mainly used indoors. Electric counter balanced trucks are available with 3 or with 4 wheels. With respect to the driving and lift performance, diesel trucks are the most powerful trucks. The are very rugged, climb up steep slopes and allow long services. Diesel trucks can lift up to 8 t loads to maxium heights of approximately 9 m.
Due to the engine noise and the exhaust emissions, they are mainly suitable for outdoor operation. Hybrid drives combine combustion drives with electric drives, making them just as powerful and just as economic. Beyond this, modern concepts are able to recuperate the energy from braking to further increse the efficiency of the type of drive. 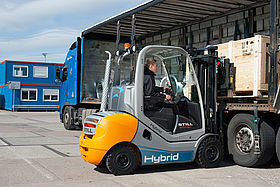 The ideal applicaion for hybrid trucks are therefore applications with frequent acceleration and braking, for example, when loading and unloading lorries. Often diesel trucks are offered with identical performance features as LPG trucks. These gas trucks are fitted with a combustion engine that is fuelled by liquified petroleum gas. Due to the lower exhaust gas emissions, the lower operating noise and the long service times, these trucks are suitable for indoor and outdoor operation. Select the requirements you know for your application. Product proposals matching your requirements. Inform yourself about the matching trucks and add them to your request. No trucks with your requirements in the online stock?